It’s a Galactic bubble with a large surprise. How large? At least 8 times the mass of the Sun. Nestled in the shell around this large bubble is an embryonic star that looks set to turn into one of the brightest stars in the Galaxy. The Galactic bubble is known as RCW 120. It lies about 4300 light-years away and has been formed by a star at its centre. The star is not visible at these infrared avelengths but pushes on the surrounding dust and gas with nothing more than the power of its starlight. In the 2.5 million years the star has existed. It has raised the density of matter in the bubble wall so much that the quantity trapped there can now collapse to form new stars. The bright knot to the right of the base of the bubble is an unexpectedly large, embryonic star, triggered into formation by the power of the central star. Herschel’s observations have shown that it already contains between 8-10 times the mass of our Sun. The star can only get bigger because it is surrounded by a cloud containing an additional 2000 solar masses. Not all of that will fall onto the star, even the largest stars in the Galaxy do not exceed 150 solar masses. But the question of what stops the matter falling onto the star is a puzzle for modern astronomers. According to theory, stars should stop forming at about 8 solar masses. At that mass they should become so hot that they shine powerfully at ultraviolet wavelengths. This light should push the surrounding matter away, much as the central star did to form this bubble. But clearly sometimes this mass limit is exceeded otherwise there would be no giant stars in the Galaxy. So astronomers would like to know how some stars can seem to defy physics and grow so large. Is this newly discovered stellar embryo destined to grow into a stellar monster? At the moment, nobody knows but further analysis of this Herschel image could give us invaluable clues. Text & image from the OSHI ESA Web page. A sweeping arc of warm dust marks the boundary between stars that have formed and power the Rosette Nebula, and stars that are still forming in the surrounding Rosette cloud. This Herschel image uses infrared light to reveal embedded stars up to 10 times the mass of our Sun busily forming inside dusty cocoons. Working from the Royal Greenwich Observatory, England, the first Astronomer Royal, John Flamsteed, discovered a cluster of stars in 1690. We know that cluster as NGC 2244. Almost 150 years later, another English astronomer, John Herschel, discovered faint wisps of gas surrounding the stars. This is what we call the Rosette Nebula. Now the Herschel space observatory, named after John Herschel’s father, William, has revealed newly forming stars – protostars – in a previously invisible portion of the surrounding cloud. 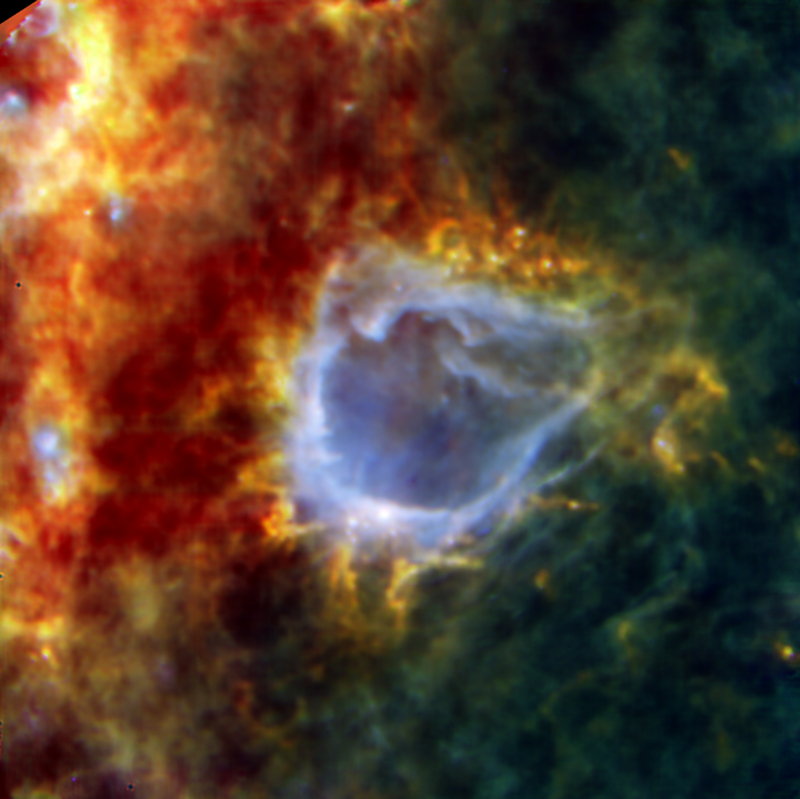 This Herschel image shows most of the Rosette cloud, which resides 5000 light-years from Earth. The original star cluster lies to the right of the image but the stars are invisible at these wavelengths. The newly discovered stars are the bright points of white light scattered across the central portion of the image. The bright smudges are dusty cocoons containing high-mass protostars. These will eventually become stars containing around 10 times the mass of the Sun. In the redder regions of the image and near its centre, are lower mass protostars, similar in mass to the Sun. If our eyes could see faintly enough, the Rosette cloud would dominate the night sky, close to the famous constellation of Orion, the Hunter. In area, it would appear around five times larger than the full Moon. As it is, the light given out by this ring of celestial dust and gas is too feeble to be seen by anything other than Herschel. 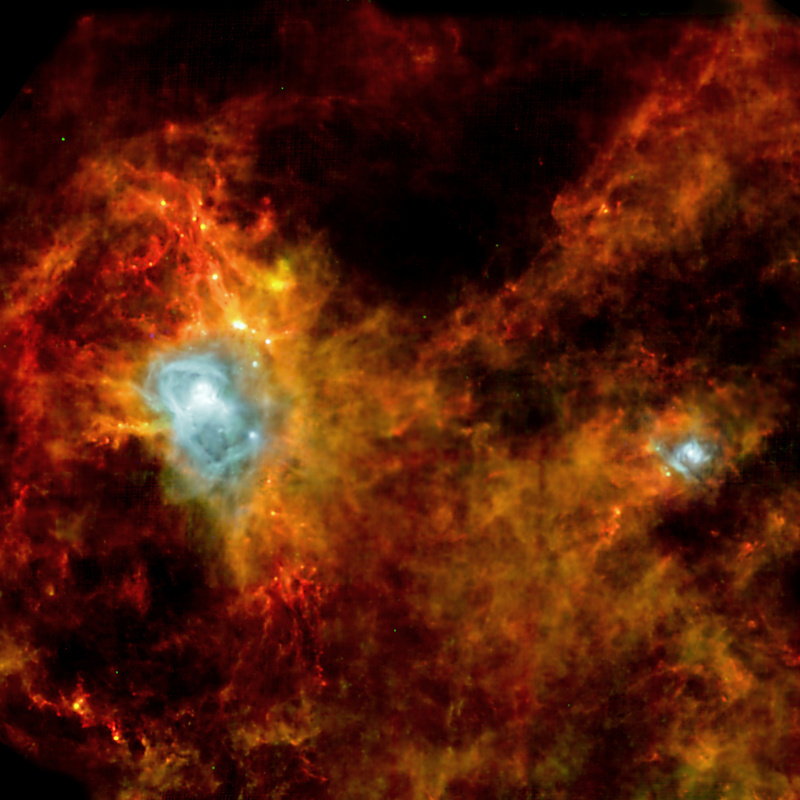 Herschel collected the nebula’s infrared light given out by dust and this image is a three-colour composite made of wavelengths at 70 microns (blue), 160 microns (green) and 250 microns (red). It was put together using observations from Herschel’s Photoconductor Array Camera and Spectrometer (PACS) and the Spectral and Photometric Imaging Receiver (SPIRE). Each colour represents a different temperature of dust, from 10K in the red emission to 40K in the blue. Pillars of dust point towards the star cluster. The picture shows the dusty component of the nebula. 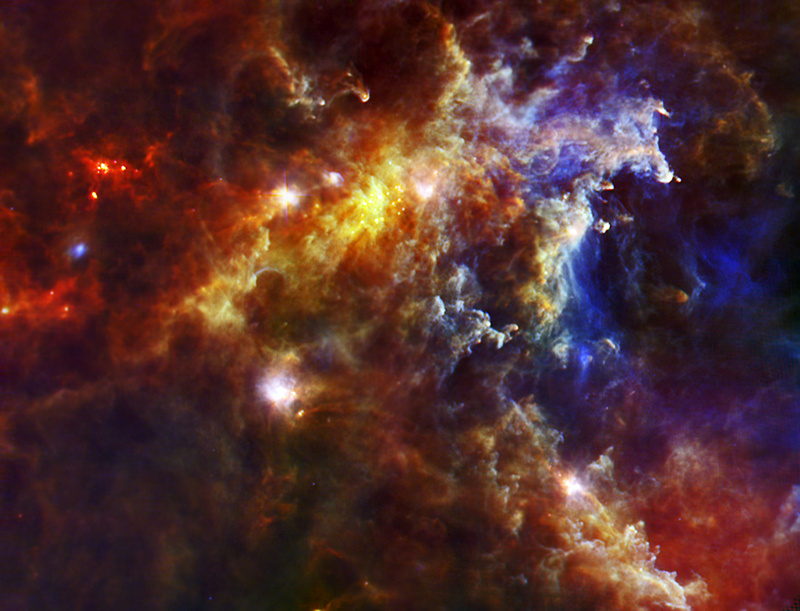 One percent of the mass in a giant molecular cloud is dust; the rest is gas. In total, the cloud contains enough dust and gas to make 10 000 Sun-like stars.